This class an iterator class for hashes of lists as returned by Qore::SQL::Datasource::select() and Qore::SQL::DatasourcePool::select(), both of which return hashes with keys giving column names where the key values are lists of column values. This class can be used as a more flexible alternative to the context statement. 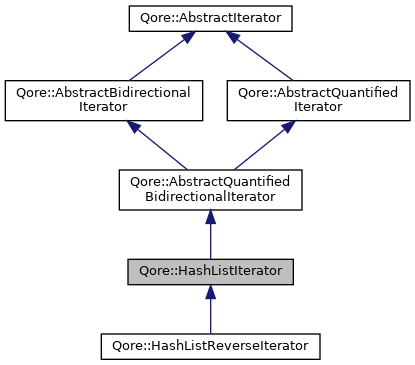 In general, the HashListIterator class is not designed to be accessed from multiple threads; it was created without locking for fast and efficient use when used from a single thread. For methods that would be unsafe to use in another thread, any use of such methods in threads other than the thread where the constructor was called will cause an ITERATOR-THREAD-ERROR to be thrown. Creates an empty hash list iterator object. Creates a copy of the HashListIterator object, iterating the same object as the original and in the same position.